In Samvega’s world, music is a voyage into the subconscious. Heavy psychedelic overtures, bellowing lyrics, and a tendency to tip toe into the darker places of the mind form the subway of sound. As visual artists the four members have learned to gulp down society and digest it on canvas with texture and color, as musicians their reaction to life and it's trials moves from the slow, the dreamy, the melodic into a tidal wave of heavy distortion. Their aim is to create soundscapes to tantalize the mind with the complexities of existence. They’re genre unspecific. Their set can move from psychedelic instrumentation, to doom, to gypsy, to blues and anywhere in between. All four members sing, and the vocals that ride on top can be lowdown outlaw, to punk cabaret. Regardless the singer, their lyrics are carefully crafted and cry of the underground, for change, for lost love. Down Dirty Shake: The Down Dirty Shake is a rock n roll band based out of San Francisco. Formed in 2005 by the founding four members. The group is deeply influenced by the soul that was the 60's. Touching on latin, psych, soul, pop and garage rock. The live shows are guaranteed to be an experience; always full of energy and raw emotion. Making all the soul mama's and papa's of the crowd feel good. Dylan Chambers is the son of Lester Chambers, lead singer and front man of The Chambers Brothers. So you know he was born to rock! He is definitely carrying on the passion and musical heritage while keeping his own unique sound and style! Dylan Chambers has played all over the US from the House of Blues and The Troubadour in Hollywood, To Lincoln Center in New York, including the festival scene, such as Venice Beach Musicfest and Performing at both the 40th Anniversary of The Summer of Love and 40th Anniversary of Woodstock "WestFest" in Golden Gate Park for over 50,000 people. 2012 Dylan Chambers and his father Lester Chambers traveled to NYC to play for the Music For Occupy CD Release Party at The City Winery. Dylan has shared stages with Steve Cropper (Blues Brothers, Booker T MGs) Eric Burden ( Animals War ) Wolfman Jack ( DJ personality ) and Joe Walsh ( Eagles ). 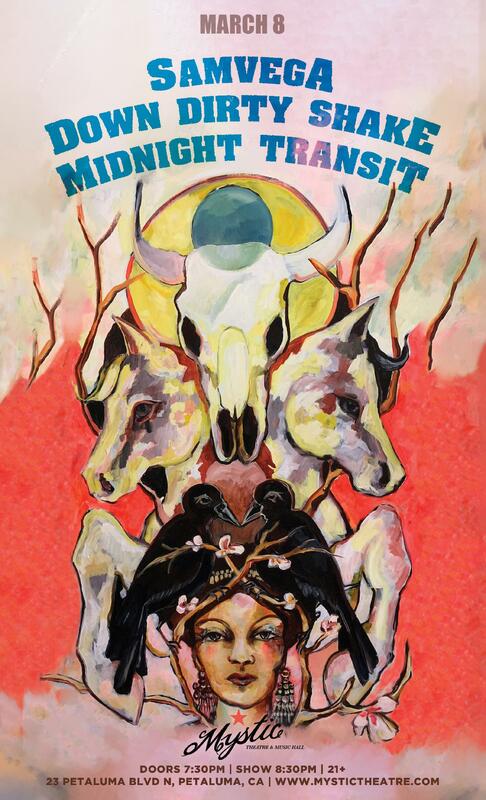 Midnight Transit have been hard at work in the studio writing new material and crafting a sound that blends Riff-Riding Bluesy Rock and Funky Vintage Soulful Pop to make you want to move and keep you in the groove! From the younger rock/dance crowd to the older fans of The Chambers Brothers, DCMT bridges the age gap and makes music that impresses your heart, mind, body, and soul!